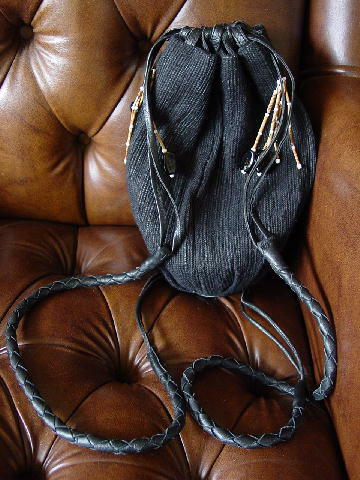 This vintage black fabric purse has a vertical ribbed texture pattern. It has a drawstring top. It has a black and white freeform fabric lining with an attached zippered fabric matching change purse. 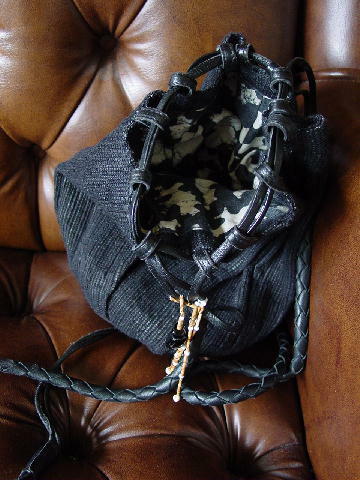 The top loops, drawstring straps, two woven shoulder straps, and bottom base are all black leather. At the end of the drawstrings are five strands of two-tone bamboo colored and tiny white beads. Two of the strands on each side have large black glass beads (one of which has a chip and had cracked and been glued). She wore it like a backpack going to clubs. It's a very cool vintage bag with great leather detailing and subtle accent beads.